You can tell what Miguel Cabrera thinks of the rest of the AL Central! 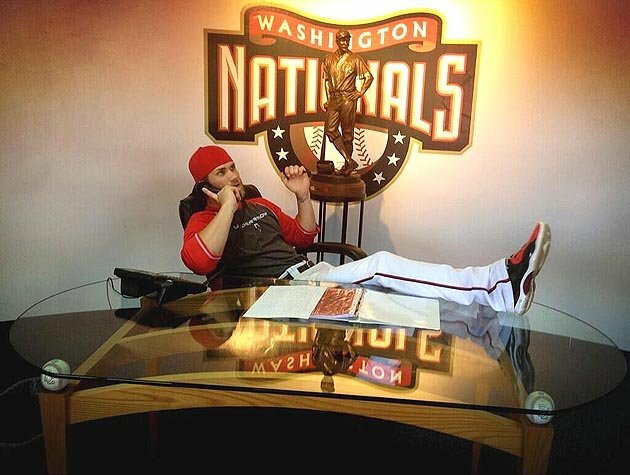 I'm on the other end of this phone call, placing an order for World Series tickets with NL MVP Bryce Harper! The 2011 Preposterous Statement Tourney (http://www.kfan.com/pages/commonbracket/index2011.html) came to a close today, with Rashad McCants completing the impossible dream. McCants' 17th-seeded statement from the Gorg Region -- that made the tournament only by winning a say-in game -- beat out Adrian Peterson and his #1 statement from the Hartman Region, 52 to 48%, in an instant classic. Rashad McCants: playing in the D-League, after initially saying he was better than 70% of the NBA, "I was being modest saying 70 percent. My honest opinion is 95 percent. 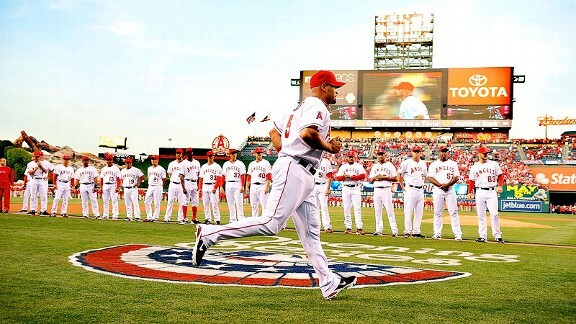 I don't even think there are top-tier All-Stars who are better than me, and they know who they are." Adrian Peterson: referring to how NFL Owners treat the players, "It's modern-day slavery, you know?" Charley "Shooter" Walters: "Speaking of Rochester, shortstop Trevor Plouffe's slugging percentage through six games is .826. Babe Ruth's slugging percentage was .690." Tim Brewster: "I'm a coach by nature, that's who I am, and I'm a darn good one." Mark Teixeira: Before spring training, "We're the underdogs this year. I love it. No-one is picking us right now." My Shooter statement lost out in the 1st Round, 51 to 49%, to Joe Schmit's "Justin Morneau returning to a spring training game must have felt like Game 7 of the World Series." Coach Brew made a strong run to the Silly Sixteen, pasting a weak utterance from the FAN's Joe Nelson 67 to 33% before dismantling Schmit's aforementioned statement, 62 to 38%. However, AP's eventual runner-up comment on slavery was too much, handily defeating Brew 64 to 36%. Teixeira started off with a convincing 61-39% win over Kevin Gorg's "The Minnesota Wild have plenty of top-end talent" statement, but ran into the buzzsaw that was the eventual champion McCants in the 2nd round, going down decisively, 78 to 22%. The tourney ended, as has become the tradition, with "One Preposterous Statement," a song I penned a few years ago (in case you haven't heard) to the tune of "One Shining Moment" that some other rube recorded and submitted. You can read more about it at the first KruschkeLeaks link I posted above. Ron Gardenhire, on Joe Mauer's power numbers being down last year: "If Joe Mauer wants to hit for power, he will hit for power." From Shooter: Twins catcher Joe Mauer, appearing on NBC's "Late Night with Jimmy Fallon" on Tuesday, won a video game batting contest against Fallon with a home run. Fallon referred to Mauer, the all-star from St. Paul, as the "Anti-LeBron James" because he could have signed for "millions of dollars more" by opting for free agency rather than remaining in Minnesota. Twins catcher Drew Butera was the Astros' first choice to replace the injured Jason Castro, according to Peter Gammons of MLB Network (on Twitter). However, the Twins won't trade Butera, according to Gammons. "You take somebody like Kirk Gibson and he might be a 15-game difference," Sax said. "And I say that because this guy is pretty dynamic. You're talking about one hell of a tenacious guy who knows how to win." 2011 PST nominee: Dave St. Peter - "Opening Day ... a state-wide holiday"
As heard on the Sports Huddle with Sid and Dave on March 20: Sid Hartman asked, "You got any big events coming up during the season?" St. Peter answered, "Opening Day's gonna be huge; I think that's really developed into a state-wide holiday ..."
Pohlad, who can see Target Field from his Minneapolis office and regularly walks to the ballpark from there, loves the current ballpark. "To me, it's just unbelievable," he said. "It's like being at Disneyland for me as an adult." 2011 PST nominee: Minnesota Twins, for "Vote now for your favorite Target Field Spruce Tree Video"
2011 PST nominee: al-Qadia rube "... trillions of Osamas will be born"
"America is celebrating Osama bin Laden's killing, but it will be a temporary celebration," said Abdullah Sittar Chishti, a member of the Jamiat Ulema Islam party who attended the rally in Khuchlak. "After the martyrdom of Osama, billions, trillions of Osamas will be born." Talking about potential Twins free-agent signee, catcher Kelly Shoppach: Shoppach also holds his own when it comes to framing pitches. On the possibility of bringing back Nick Punto as a free agent next year: He (Punto) also draws enough walks (10.2% career, 15.3% this year) to be respectable offensively. This is a powerful ("shocking, award-winning") documentary; I'd recommend it to anyone. 33 minutes, but goes quickly. Riveting and thought-provoking. 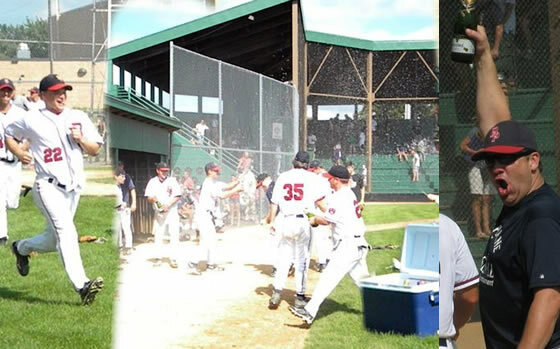 My thoughts on adding 16 more teams to the Class C State Tournament based purely on fan attendance strongly concur with St.
Joseph's Brent Schloe and Stewartville-Racine's Andy Johnson (as posted to "Bill's Blog" on the MBA website: http://www.minnesotabaseball.org/BillsBlog). baseball board, of which I've been a member for 20 and 13 years, respectively. Also, I have a great appreciation for the time and commitment State Board members put forth in maintaining and ensuring the prosperity of our game. Whether I agree or disagree with them on certain issues, I will always respect that. That said, I think the recently passed changes are misguided and a complete sell-out of the integrity of the amateur game. While I also adamantly disagree about draftees– I think teams should win or lose with their own players, just as they did all season long – at least those results are determined on the field. attendance?? I am stunned and disheartened that the issue was even brought up, much less unanimously passed. Doing so will open up a circus-like can of worms that I predict few will feel good about being associated with. I don't know what kind of financial shape the MBA is in, but to me it could never, ever be bad enough to come to the point where the integrity of the tournament is compromised. I have been fortunate to be a part of 10 state tournament teams in my 20 years in uniform, and each time, it meant something to us. It was a big deal, because it's not easy. To me, seasons in amateur ball are defined by whether or not you make the state tournament. The BP Tigers celebrate clinching a state tournament berth with a 3-0 win over the Chanhassen Redbirds on Aug. 7, 2011.
cookies, for that matter – than to further alter the purity of the championship chase. State tournament appearances matter because they are earned, not handed to you. past eras, and coming to the conclusion that we must be doing something wrong. My opinion is that the golden era of town-team baseball – from a fan-attendance perspective, anyway – is long gone, and we need to accept that reality. Mr. Schloe nailed this issue, but to repeat: people's lives are busier than ever. And their kids' lives are busier than ever, at an earlier age – especially through year-round, never-ending travelling teams and weekend tournaments that pull families in all directions. People aren't "looking for something to do" anymore; they're trying to figure out how they can squeeze one more thing into an already overloaded schedule. We have a great game. The level and depth of talent is impressive, the number of teams across the state remains robust, and the tradition of the tournament provides thrills like clockwork. What's changed is the number of fans. It's not anybody's fault –it's just the way it is. attendance is a noble one. But this is entirely the wrong way to go about it. I implore the state board to reconsider. Is anybody unaware of the wildly unpopular BCS playoff system in college football? Then why, I ask, would we want our own version of it in town-team baseball? THIS IS THE STORY I've been waiting to write for a long time. It was probably just a few months after the scandal when I first began telling myself, "Someday, maybe 5 or 10 years down the line, I'm going to write my version of the story for the (Belle Plaine) Herald." Well, here we are 20 years later, and KruschkeLeaks is going to have to suffice. > I believe we were 1-7 or 1-8 at the time of the suspension (probably more accurately called expulsion), not 1-11. 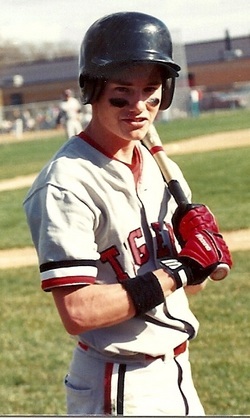 I remember the first baseball meeting of the season in the spring of 1989 - my sophomore year - and our introduction to the new head coach, Jay Soule. All of us were on board from the beginning: he had a presence, we ate his stories up, and he was just a cool guy. He had pedigree as a great player at Gustavus (just ask him), and that carried some clout as well. We liked him and he liked us. 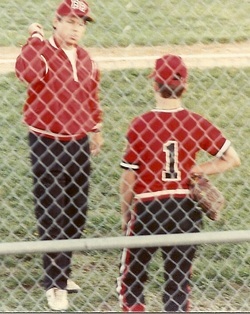 The next story in my mind's timeline is several of us ballplayers having breakfast with the coach out at the new Hardee's (where I was the first customer ever, thank you very much) one morning in Belle Plaine, and I remember us kiddingly making a reference to playing softball, and Coach giving us the "you guys know what I think about that" smirk. It was something we joked about, openly. He knew we liked to play, and we knew he didn't want us to. But that was as far as that conversation ever went. Another example of this understanding between us is a video I did for Doug Anderson's "Video Productions" class (greatest class ever) called "Kruschke Knows" based on the popular "Bo Knows" commercials of the time. Just like Bo Jackson, the video shows clips of me excelling at a wide variety of sports and people from those sports confirming, "Kruschke knows (name a sport)!" For baseball, I had Coach Soule say, "Kruschke knows baseball!" and then soon after, he cuts in to say, "Kruschke BETTER NOT know softball!" It was good stuff; I can borrow you the video sometime if you like. For the previous couple summers, a bunch of us baseball-loving classmates also played a few softball tournaments together when our baseball schedules allowed; we loved it, because it was just another way to play ball and hang out together. Since t-ball we played every summer league the town ever offered - from Little League to Babe Ruth to Legion, and soon after our fateful spring of '91, town team baseball (of which I am the last of the Mohicans still donning a uniform among my classmates, although it should be noted that the majority of my uniform donning has taken place on the side of the chalk lines nearest the dugout). But softball was just another thing to do together; it was sports and it was fun. I don't recall if 1991 was the first year we played on an organized team in the Belle Plaine men's slow pitch softball league or not, but I do recall us having some slight apprehension about playing before saying, "Let's just play." We had the uniforms, we were in the league; we were going to play. We knew the coach didn't want us to, but we didn't understand or agree with the logic as to why we couldn't or shouldn't; it was just a harmless softball game to us. It's not going to screw up our swings... (we were already 1-8; how much worse could they get?!) I don't think we were too concerned that it would be reported, or if it was, that we would be in any real trouble. Put it this way: I think it's pretty safe to say that if we really thought we would have been kicked off the team - or even suspended at all - for playing softball, we wouldn't have. Standing: Jeff Gansen, Brad Muehlenhardt, Zip Zellmann, Jason Noll, Trace Selly, Shannon Keohane. Seated: Terry Kahle, Jason Piche, Brett Kruschke, Chad Behnke. It's probably time for introductions to the seven suspended seniors our coach later dubbed, "The Magnificent Seven." Six of the seven are pictured above; missing is my cousin, Pete Kruschke. The others doubling up on baseball and softball were Jeff Gansen, Brad Muehlenhardt, Jason Noll, Trace Selly, Terry Kahle, and myself. I'm guessing we played our softball game on a Thursday night, because I believe it was a Friday morning when we showed up for school and were told to wait on the bench in the lobby as Athletic Director Donna Brinton-Hawkins needed to speak with us. We started to do a few "uh-ohs" and half-nervous giggles amongst ourselves, but had no idea what was in store. Coach Soule was gone that morning but had heard we played a softball game the night before, and Brinton-Hawkins said we were to turn in our uniforms by the end of the day. Talk about floored! We had been with the "program" since 7th grade baseball, and here with a few weeks left in our senior year, our final season, it was over just like that?! Wow. Needless to say, we weren't happy and news of the decision spread through the school like wildfire. Pretty soon everybody had an opinion one way or another, most seemingly against us. 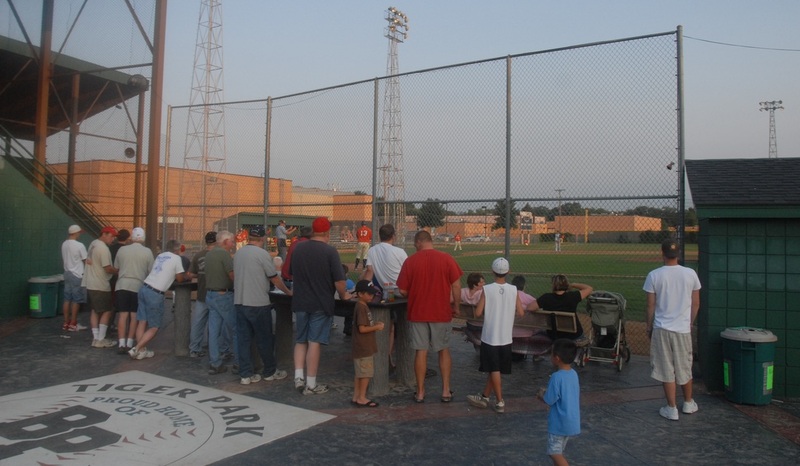 The next thing I remember is either that same evening or soon thereafter, all of us players and our parents met up at the ballpark and discussed the situation, deciding if we wanted to go ahead and fight it. We knew we could be in for some crap, but decided to do so because we felt we were being wronged. > Playing softball was not against the rules of the Minnesota State High School League. I could get into the argument about whether or not the mechanics of hitting and throwing a softball screws you up for baseball (I think it's preposterous), and how we strangely had the blessing of the coach to play softball in the summer, but those were our key points. So we appealed to the school board on the evening of Monday, May 13, and were reinstated by a 3-0 vote with two members abstaining and one member absent. The heart of the 1-8 Tigers was back, baby!!! Coach Soule was not at this meeting either, but once he caught wind of the board's decision, the power play was on: soon we were hearing that he would resign - and so would a bunch of other teachers and coaches (personally I'd have loved to see that bluff called) - if the suspensions were not upheld. So showing no backbone and succumbing to political pressure, the school board disregarded their 3-0 ruling from Monday night and declared there would be a "once-and-for-all" hearing on Wednesday night, to be held in the elementary school gym - primarily to accomodate an expected large crowd of townspeople, who had become enraptured with the whole ordeal. Jump back a day or two into the halls of Belle Plaine High School - I was sitting in my mom's 3rd hour class and could hear a commotion across the hall. One of our softball players, Chad Behnke - whose dad also sponsored our team, the Behnke Machine "Screw Crew" - was defending our side of the story against a teacher and several classmates. Maybe not a great decision, but I decided to join the fray. Each side would be given a few opportunities to speak their case at the big elementary school meeting, but the truth is we had about as good a chance to get reinstated to the team as Delta House did at their hearing in "Animal House." "You're OUT! Finished at BPHS, expelled! I want you off this campus at nine o'clock Monday morning, and I've contacted your local draft boards and told them that you were all, ALL eligible for military service!" After a lot of back-and-forth in what was really quite a spectacle, the board voted 4-2 to rescind their decision to reinstate us from two nights earlier. (I guess there's not a lot of consolation in the fact that if you combined the two school board votes, we still would have won by a 5-4 count!) But not before I, somehow selected as one of our side's speakers, got up and nervously flubbed around before saying, "Yeah... well one of the teachers said they wanted to rip my head off and throw it in a wastepaper basket!" So much for the last-ditch emotional appeal. I also remember one of our moms telling the audience, "But these are good kids!" We got a lot of mileage joking about that one for months to come, at least. We did have the school board chairman, Erv Malin, on our side, and that was a good feeling. As he stated in the Star Trib column, "The penalty was excessive," it was not "well communicated," and "They were being punished for something positive." Couldn't have said it better myself, Erv. The story could neatly end there, but there's some other things I just have to include. > Went further than any boys basketball team in BP history (lost by 2 points, in overtime, in the Region championship for a chance to go to State. We took it in stride, saying to each other in the post-game locker room, "Well, time to get out the sticks!" 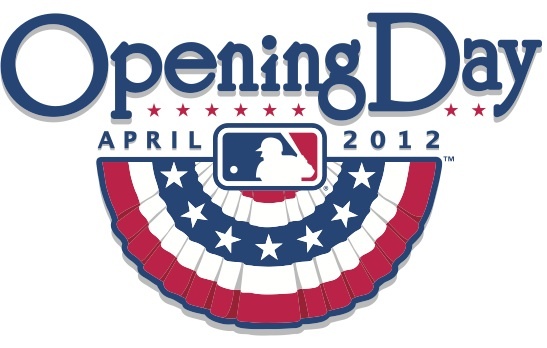 meaning it was now baseball season). Every year the Belle Plaine Herald recaps their "Top Ten Stories of the Year," and we were ranked somewhere in the middle - it was a huuuuge deal in town. More than anything, what I learned through this situation is that people tend to side with the powers-that-be, no matter what the truth may be or what common sense might say. I guess that was a valuable life lesson, anyway. But from teachers and coaches to fellow students and townspeople, I remain to this day shocked at how many thought we got exactly what we had coming to us. Nothing like a spiteful yearbook staff to salt the wounds! There is no record of our names or pictures of us on the baseball page in the 1991 yearbook - just like Clem Haskins' 1997 Final Four team! Word is that one of the fathers of a current B-Squader at the time told Coach Soule about our playing softball, with the thought that it would get his son brought up to the varsity. I don't know if that's true, but it is a pretty interesting detail. And I have no problem with any of the B-Squaders, for the record; many of them were, or still are, friends. This list "is what it is" - the top ten most played songs on my iPod (affectionately known as kruPod). It's not my top ten songs of all time - although several of them may be. It's not the best videos... it's not the ten best of all-time or my ten favorite songs on my iPod - but it IS the ten most played. One thing all these songs have in common is they have all been downloaded from iTunes - since they default into a neat little list that way and I am apparently too lazy to create my own playlists so far. Oh well. While a lot of the almost 7,000 songs on my iPod could stand to be deleted (I'm workin' on it), the vast majority of my favorite songs are on there and a true "top 10" list of my favorites would look fairly different. Maybe I'll do that post someday down the road (oh goodie, I know you can't wait). Note: they are listed in order from #1 to #10, so Harvey Danger's "Flagpole Sitta" is my #1 and Wayne Newton's "Danke Schoen" (from my #7 movie of all-time, Ferris Bueller's Day Off) is #10. "Who are these effin' guys?!" It's too late now, but I'm gonna post anyway. Timing isn't everything in blogging, but it is pretty darn important - especially in the sports world. Well, for about the last 10 days I've had in mind to post something about "Cleveland here to stay, KC going away" and of course over that time the Indians have just kept winning, and winning, and winning - to the point that it's not even much of a statement anymore. And yes - o ye rare and faithful reader of KruschkeLeaks - you will recognize the immediate irony in that declaration when you recall that on April 6th, I picked the Indians for 5th place in the AL Central and a measly 68 wins. Hmm. That said, we have found out a LOT about the Indians in the first month of the season: namely that every possible question mark about them has turned up roses. Asdrubal Cabrera? Flashing his promising '09 form, with extra power to boot. Travis Hafner? Written off for dead for years now, thumping once again. Grady Sizemore? He didn't go 'til the 8th round of our fantasy draft, and I wanted nothing to do with him bc of the dreaded microfracture knee surgery. Naturally, he has returned to looking like the Grady of old (minus the stolen bases). Carlos Santana? Putting all concerns about last year's horrific knee injury behind him (as the picture at left more than attests). Matt LaPorta? Showing power and finally starting to deliver on the promise that made him the key cog in the CC Sabathia trade with Milwaukee. And the one position where they're most milking a player - third baseman Jack Hanahan? Polished prospect Lonnie Chisenhall waits in the wings, and likely will finish off the latter half of the season for the Tribe. He could have an impact like Danny Valencia did for the Twins last year. 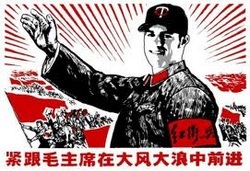 Throw in their one rock in Shin Soo-Choo and our old guy O-Cab - all he does is win wherever he goes! - and this lineup easily looks like the division's best, right now. If the Indians falter I do think it will be their pitching that lets them down, despite their 3rd place standing (3.48 team ERA) in the A.L. so far. Masterson, Carmona, and Carlos Carrasco (currently injured) are a decent-enough top 3, although there's no true ace among them. Their #4 and #5 starters and likewise candidates are mostly a bunch of thumbers who scream regression. Chris Perez is a solid option at the end of games, but the front office may have to make a move or two as the summer progresses. As for the Royals, I have little doubt that they will return from whence they came - challenging for the cellar once again. KC has a lot of great young players on the way, true, but there will be a lot of turbulence as they integrate themselves to the big leagues over the next few years. Their climb probably won't begin until 2013 at the earliest. So why the heck didn't I at least pick Cleveland to beat out the Royals this year? Great question, and while not satisfying to me now, I do at least have somewhat of an answer for you. Over the last two years, I have felt a tad "sleeperish" about the Tribe, only to see them show absolutely nothing and underachieve. I finally figured "I'm the one missing something, screw 'em" and now of course, it looks like they're shooting the sequel to Major League. Go figure.